Remember the Joy of Christmas! The joy of Christmas seems to have given way to the pessimism of ordinary time. I have worked with our congregation to embrace the more traditional view of Christmas which encourages us to celebrate a Christmas that lasts until Epiphany. We were able to sing Carols and have special music in worship that highlighted the gift of Christ. Just like the liturgical calendar, which quickly shifts to ordinary time, I believe that we find it very easy to put the joy of Christmas away with our decorations. A few years ago I told of how our family keeps many of our manger scenes out year round. This isn’t just because we have an extensive collection that would be way to hard to put up each year. We keep out the mangers in order to be reminded of the joy that God has provided. For most, the cross is the most identifiable and present symbol of their faith in Christ. This is appropriate since in Christ’s death and resurrection we find our freedom. With that said, even though as Reformed/Presbyterian believers we most often encounter the empty cross, it isn’t always an image of Joy. A simple glimpse at the cross doesn’t instantaneously connect us with the joy of resurrection. Compounded by the fact that a cross is one of the most popular jewelry accessories, the significance of the image has been corrupted. Now of course the manger scene comes with it’s own baggage. We know it was more likely a cave than a barn. We also know that kings aren’t there the day of the birth nor is a number ever given. Still, I think we can learn something by keeping the manger in our minds, if not our presence. In the manger, we find a pure expression of how God loves us and also how God works with us. Present in the manger are people of all stripes. Not to mention we find the simplicity of a mother and child. Have you ever noticed the faces on nativity scenes? A good figure of Mary is able to express the joy, concern and awe in her face. Isn’t that how we should receive God? With a deep sense of reverence and yet also with the knowledge that God is going to work with us. That baby can’t take care of itself anymore than we can. That’s the power of God being expressed. With all that is going on in our world today it is easy to allow the joy of Christmas to be crowed out by the acrimony. Not that we should bury our head in the sand and ignore the problems and concerns. On the contrary. The hope we find in our faith should help us have the courage to forge forward into life with hope. 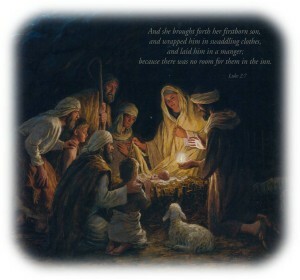 I invite you to take a moment today to take a peek into the manger again. Remember the joy of Christmas. It’s often said we are “Easter People.” This is true, we live our lives in response to the resurrection, but the work of the resurrection begins with a simple family and the babe in the manger. Joy To The World! This entry was posted in Tuesday Tidbits and tagged christ presbyterian church, christmas, christmastide, congregations, Cross, geoff, God, growth, Jesus, manger, presbyterian, spiritual growth by Geoff McLean. Bookmark the permalink.